This chapter provides instructions for how to provision DID numbers from DID suppliers – other PortaSwitch® owners on-demand. The FastNet service provider needs DID numbers to provide residential VoIP services to its customers. 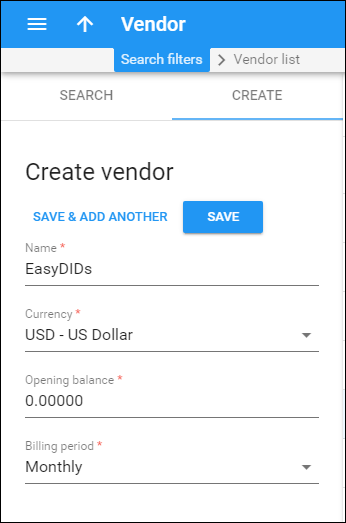 It has signed a contract with EasyDIDs to provision DIDs from them on-demand. For DID number usage, FastNet will charge their customers a $5 additional activation fee and an $8 additional monthly recurring fee. If you have a pool of DID numbers and wish to sell them to other PortaSwitch® owners, please refer to the DID Exchange Among PortaSwitch® Owners handbook. The checklist below assumes that you have already configured the routing between your system and that of your DID seller according to the instructions provided in the previous chapters. To obtain DID numbers from your DID supplier, it is necessary to configure PortaSwitch® to operate as a DIDPool client on the Configuration server. 1. Clone the active configuration and open it. 2. Go to the Admin node and select the BrandedDIDPoolClient for the required billing environment. 3. Set Yes for the Enabled option. 5. Verify the new configuration and click the Check / Apply button. Note that the Apache service will need to be restarted, so consider applying the configuration during an off-peak time. Create a tariff that describes the costs of incoming DIDs from the EasyDIDs provider. 2. On the Create tariff panel, fill in the tariff details. In the Applied to select menu, choose Vendor. Leave the Routing option disabled, since no routing actually takes place for this vendor, i.e. the vendor will be sending calls to your network. The process of entering incoming call rates is similar to the one described for other vendors. If your vendor does not actually apply per-minute charges to deliver incoming calls to your network, you can use the wildcard destination (|) to enter a single zero rate in the tariff. 1. On the vendor tariff’s panel, click Rates and enter the rates applied to you by the EasyDIDs provider. This entity is required for keeping track of incoming DID expenses, to provide an adequate level of security on the network and also to configure the interconnection with the DID vendor via his API to query, reserve and release phone numbers. 3. On the Create vendor panel, fill in the vendor details. Please refer to the instructions provided in the Create Vendors chapter of the Basic Residential VoIP Service section for a detailed description. 5. Go to the General configuration panel and select DID provisioning to configure on-demand provisioning of phone numbers. · DID provider - Select Another PortaSwitch carrier from the list. · Password – Specify the password to connect to the DID provider’s server via API. · Vendor DID batch – Either select one of the existing ones or provide a name for a new vendor batch. It will be automatically created in your DID inventory. · Incoming costs tariff – Select the tariff that describes your incoming DID costs. · Accept calls on SIP server – Select your PortaSIP® node here. 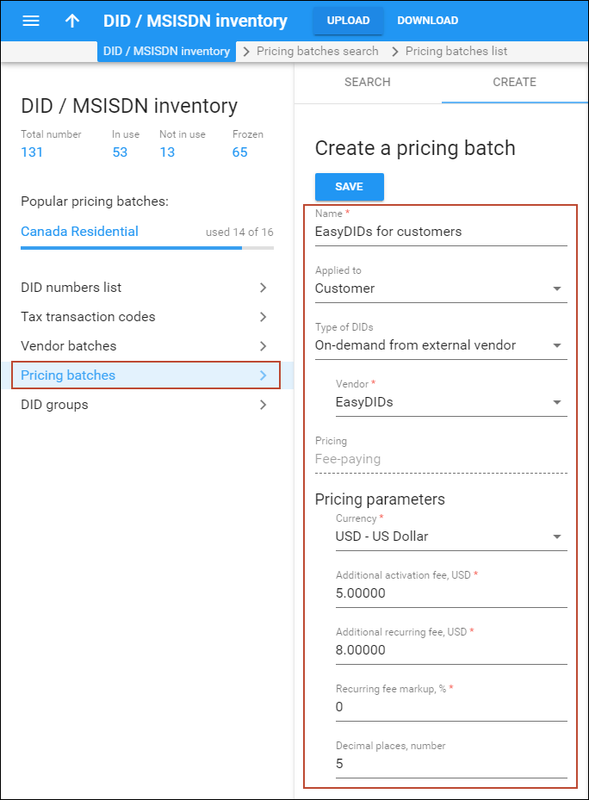 To provision DID numbers to your customers and charge for their usage, it is necessary to create a pricing DID batch and define your DID markup within. 1. On the DID inventory panel, select Pricing batches. · Name – Type in a short name for the pricing DID batch object. · Applied to – Select Customer, since this is the batch that will be used for charging customers. · Type of DIDs – Select Inventoried as the batch contains DID numbers previously uploaded to the DID inventory. · Pricing – Select Fee-paying. o Currency – Select the currency to be charged for DID usage. Note that this batch can only be assigned to customers who use the same currency. o Additional activation fee – Type in 5 here. o Additional recurring fee – Type in 8 here. o Recurring fee markup – Specify a configurable increase of the DID cost (charged by the DID provider) included in the recurring charge in addition to the actual DID cost. o Decimal places, number – Specify the rounding pattern to obtain “marketable” figures. This will specify the last “pre-set” digits in the figure. 1. On the Customer panel, select Personal, then General and go to Additional info panel. 2. On theAdditional info panel, select a previously created pricing DID batch in the Auto-provision DIDs via batch field. Click Save. 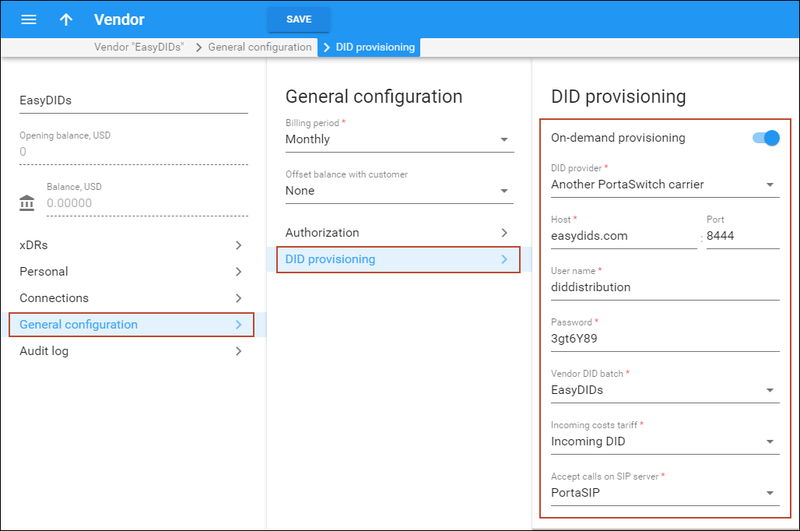 Similar to on-demand DID provisioning from external providers like DIDWW or DIDX, a DID number can be provisioned as an alias to an existing account. Please refer to the How to handbook for instructions on how to add a DID number as an account alias from the administrator web interface. Alternatively, you can add a DID number as an account alias on behalf of a customer using the customer self-care interface. 1. Log in with the customer’s web access login and password. 2. On the IP Centrex tab, select DIDs. 3. Click the Add DID button. 4. In the Add new DID number dialog box, filter the DIDs by country and area and select a number. Click OK.
· Click the Edit icon. · Select the account from the Assigned to list.